Costa Coffee Club is a loyalty program by Costa. You earn points with every purchase. What is Costa Coffee Club? Costa Coffee Club is a loyalty reward program offered by the Costa coffee chain in the UK. Similar to other reward schemes, you receive points for each purchase which add up to a free coffee or discount. How does Costa Coffee Club work? 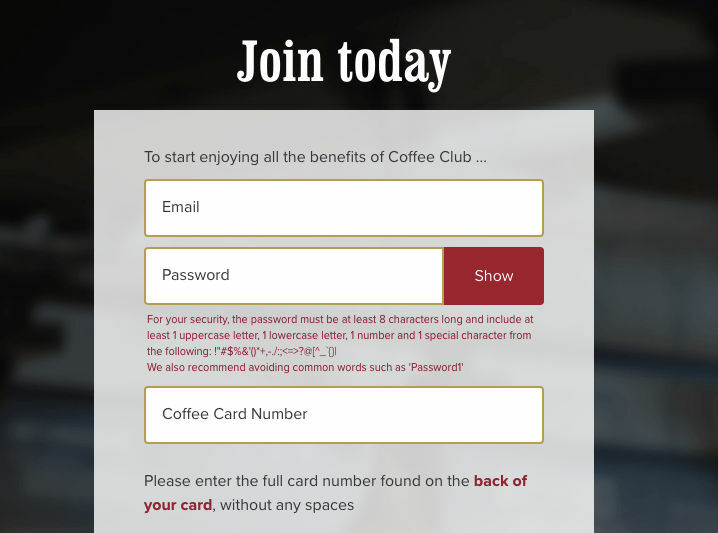 The Costa Coffee Club works with the use of a physical or digital loyalty card. You can pick up a card in any shop for free. Ask a member of staff. When you make a purchase, give the staff your loyalty card before paying. They will swipe or scan your card to give you points. These points are held in a digital account which you can access online or via the Costa app (see below). You earn points with every purchase. These points add up towards a free drink or discount. You can ask a member of staff how many points you have, and whether you are eligible for a free drink or discount. Rather than get a physical loyalty card in-store, you can also download the Costa app for free. This is available on the Apple App Store and Google Play Store. Before you pay for your order, open the Costa app, and scan it at the counter. You will see there is an outward facing scanner (usually with a green light). Hold the screen of the phone pointing towards the scanner and wait for it to beep. If you have any trouble, ask a member of staff for help. Are Costa Coffee Club cards free? Yes, you can pick up a Costa Coffee Club card in any store and they are free. If you lose your card, you can pick up another one and ask Costa to put the points onto the new card. (See below on how to do this). The Costa app is also free to download. You can get it at the Apple App Store and the Google Play Store. What are Costa Coffee Club points worth? When you spend £1 you receive 5 points. Each point is worth 1p. So you get 5p in rewards for every £1 you spend. You can also think of this as a 5% reward. NOTE - You only get points for every £1 you spend. So if a coffee is £2.45, you'll only get points for £2. That's 10 points. How many coffees do you need to buy to get a free one? A Caffe Latte (size Primo) costs £2.15. Costa Coffee Club reward is worth £0.10p. £2.15 divided by £0.11p is 21.5. £1.95 divided by £0.05p is 39. I have made a free Costa Coffee Club calculator here. This shows you the value of points for each purchase. Whenever you visit and you'll earn 5 points for every £1 you spend. Each point is worth 1p. Is Costa Coffee Club worth it? If you only buy drinks from Costa then yes, some reward is better than no reward. However, the Costa Coffee Club reward program is not as good as others such as Caffe Nero. Whereas Costa Coffee Club effectively gives you a free drink for every 28 you purchase, Caffe Nero gives you a free drink for every 9. The average value of points given back to you for a purchase at Costa is £0.10p. You can save more money by bringing your own cup. Costa gives a £0.25p discount if you bring your own cup. Costa confirmed to Latest Deals that if bringing your own cup may reduce the number of points you get on your loyalty card. If you have the Costa app, you can receive notifications of discounts and special offers. These may include a discount on a pastry or cake, or a buy one get one half price kind of offer. Members of Latest Deals have not yet seen a free coffee being rewarded on the app. Once you have downloaded the app for free, there is a quick and easy sign up. Fill in your name, email address, date of birth and nearest store. You’ll then be set up and ready to go. Go to the ‘Rewards’ tab and you’ll see there is a QR code (the square thing that looks like a barcode). This is what you scan in the shop to get your rewards. Again, if you have any questions you can ask a member of staff. Your total points are shown at the top and you can also see your points history. 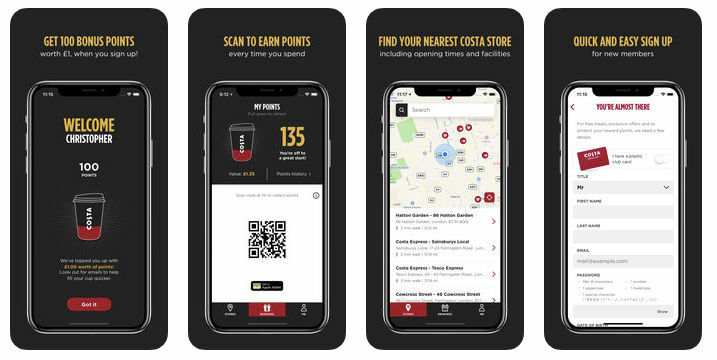 Now, every time you go to Costa you can scan you app and get points. Go to any Costa shop and you can get a physical loyalty card from the shop counter. You can use it straight away to earn points. You then need to register your Costa card. Go to this registration page on the Costa website and enter your email address, a password and the Coffee Card Number. Where is the Costa Coffee Club Number? You can find the Costa Coffee Club number on the back of your card. It is the long number, between 16 and 20 digits long. Enter this on your registration form along with your other details. If you lose your registered Costa card, Costa will replace it for free. Your points will move from the lost card to your new card - if you registered it. 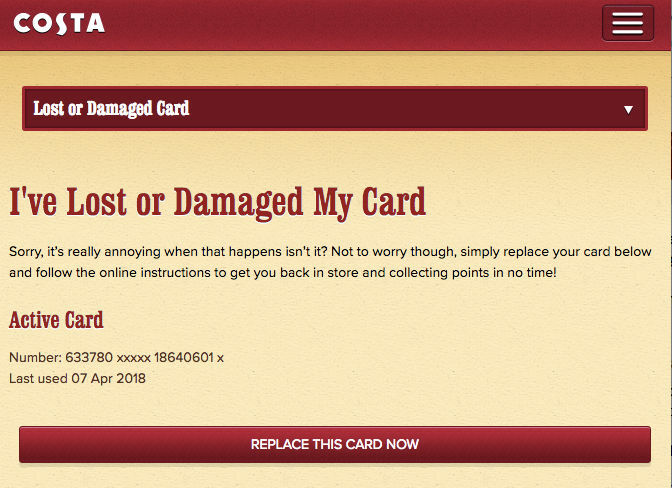 You can replace your Costa card on the website. Login and follow the instructions on the Lost or Damaged Card page. If you’re having trouble logging in to the Costa website, simply use their contact form and a support team member will help you. How do I transfer or merge points from one Costa card to another? You may have more than Costa card and want to merge or transfer points. The Costa support team can help you do this. Usually, within two working days a Costa support member will have done it for you. Your points will be merged onto the one card. 2. 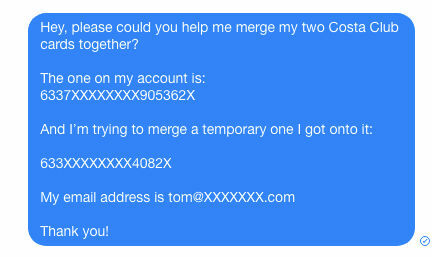 Contact Costa support via their contact form and write the same thing as above. Do Costa Coffee Club points expire? Yes, after 12 months Costa Coffee Club points expire. 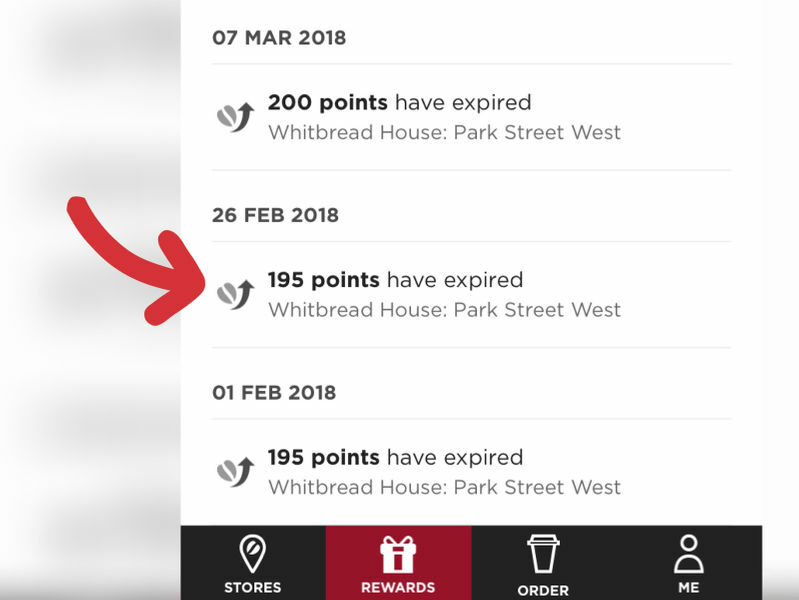 If you have the Costa app, it will show you in the points history that it has expired. 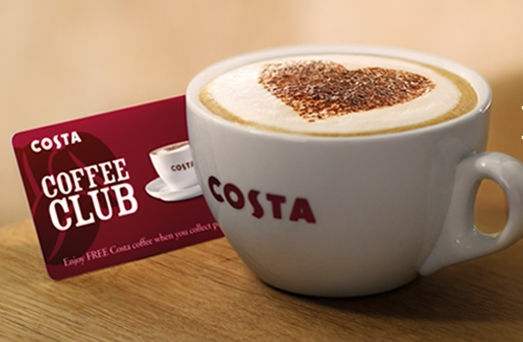 Costa Coffee Club points expire after 12 months. The following picture shows you a Costa Coffee Club points chart. 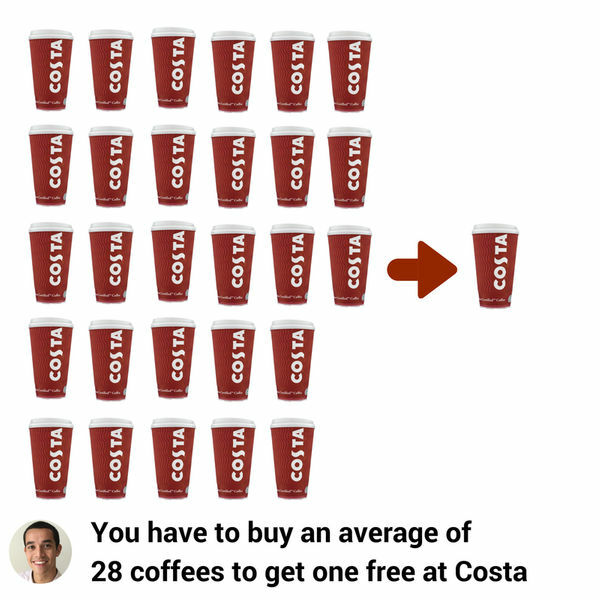 It illustrates how you need to buy 28 coffees on average to get one for free. This assumes you buy 28 of the same product and size without extras such as cakes and croissants. Note - it's an average, so you may have to buy less. The Latest Deals calculator found the least you have to buy is 22. If you love Costa and are loyal to it, then having a Costa Coffee Club reward card makes sense. Something is better than nothing. After you buy 28 coffees you get one free, which equates to about a 3.76% discount. However, it would be better if you bring your own cup. This gives you an immediate average discount of 11.58%. Plus, you can stack it with the loyalty card and carry on getting points. But if you are drawn to Costa because of the Coffee Club rewards, don’t be. Have a look at the Costa Coffee Club calculator. You will see the average amount you’ll have to spend to get a free drink is £54.30. Other coffee shops such as Caffe Nero offer much better value for money in terms of rewards. Plus, you can save even more in the long-term by purchasing a cheap coffee machine. These can cost less than £40, and then with capsules such as cheap Tassimo pods from just 13p each, you will save much more in the long-run. Do you have any questions about Costa Coffee Club? Ask them in the comments and I will do my best to answer. For more expert money saving guides, join Latest Deals for free today. Its another complete ripoff to tempt you to spend in these stores - I make better coffee at home - Nothing like a Jamaican Blue Mountain coconut latte espresso in the morn!